American rock band Imagine Dragons released their highly anticipated sophomore album Smoke + Mirrors this week. The followup to their 2012 smash hit Night Visions, Smoke + Mirrors finds Imagine Dragons boldly developing their sound through the same kind of musical exploration, lyrical depth and sonic experimentation that made their debut album an international success. A nonstop whirlwind of “high highs” and “low lows” is enhanced with creative and adventurous production that defies expectations while remaining characteristically Imagine Dragons-esque. Cohesive yet unique in both style and approach, Smoke + Mirrors is Imagine Dragons’ finest work to date! Smoke + Mirrors’ thirteen carefully-crafted songs are the product of over 150 demos written on the road during the past two years, the bulk of which has seen Imagine Dragons (aka Dan Reynolds, Daniel Platzman, Wayne “Wing” Sermon and Ben McKee) extensively touring the globe in a near-constant spotlight. It is a musically and lyrically intense album: As discussed in Atwood Magazine’s Smoke + Mirrors preview last month, Smoke + Mirrors‘ most striking features are the explosiveness, heaviness and darkness that permeate its songs, leaving the listener with a sense of excitement, wonder and, for the deeper, more attentive listeners, introspection and disillusionment. That is not to say this album is bereft of joy and celebration – in fact, several tracks like “It Comes Back To You,” “Summer” and the album’s hit single “I Bet My Life” are cheerful and positive – but as a whole, the songs on Smoke + Mirrors reflect greater depths of human emotion and an internal struggle between confidence and uncertainty. The album provides an opportunity to look behind the curtain at the fragile and duplicitous nature of success. Smoke + Mirrors displays Imagine Dragons’ growth while offering a collection of beautifully intricate, expressive and powerful songs, but like the title track asks, is it just smoke and mirrors? To find out, Atwood Magazine sat down with Imagine Dragons’ Daniel Platzman for an exclusive one-on-one interview. You began developing a heavy style on Night Visions, but Smoke + Mirrors really brings out that deep industrial and hip-hop influence - especially on the drums! We as a band have always been kind of not concerned with genre lines and rules about what we can and can’t do in our music. Dan [Reynolds] grew up listening to hip hop, and I’m from Atlanta and grew up listening to a lot of hip hop – a lot of the players down there are amazing session drummers doing a lot of hip-hop and R&B. For example, every Thursday I would go see trumpeter Russell Gunn play, and the drummer was usually Lil John Roberts (one of my favorite drummers). His style of playing drums definitely influenced mine (check out a video here). so with all that music that Dan and I listened to growing up, I think you can find some of those elements in Night Visions, but you can definitely find them on Smoke + Mirrors as well. I feel like so much of the record is characterized by these big, gigantic explosions completely juxtaposed by soft, melodic breakdowns. We’re always trying to make music that’s dynamic – that has high highs and low lows. At the same time, we’re also always trying to stay true to the music. We definitely didn’t go into it being like, “If we go big, we have to go small immediately afterwards” – or anything like that, but we’re always trying to create the most dynamic and interesting music that we can! Smoke + Mirrors certainly shows a musical maturity of the band from your debut. You guys released a slew of EPs before Night Visions, and Night Visions ended up as a partial compilation of those previous EPs, whereas Smoke + Mirrors comes from a more cohesive timeframe. That’s a really good point. We as a band took our time making our debut record because you only have one chance to make a debut – a first impression. It took a bunch of EPs before we felt comfortable doing that. After Night Visions, we were pretty much touring all the time, so we started writing immediately. All throughout the touring we were writing… So we entered the studio with – and I’m not even exaggerating – over 150 demos that we had to go through and try to select what would create the most cohesive album. We had to decide what were our very favorite songs and what kind of an album we were trying to make, and we took a long time with that. This time around we also had our own studio, whereas we recorded elsewhere for the first one. Recording a whole record in your own studio gives it cohesion as well, and shapes a uniform sound of sorts. What are the chances of people getting to hear those 150+ demos? [laughs] Well they don’t go anywhere! A lot of those demos are going to be in contention down the road for things. One of the great things that having 150 demos allows you to do is to mix and match. Let’s say there’s a part of one of those demos you really like, and then while you’re working on another song, you suddenly realize that, that part would fit perfectly there! It’s just more ammunition in the repertoire, so you will definitely hear the very best of the 150 demos! Did you find that you took a lot more time recording and producing each song, getting everything precise down to the note? We for sure had the luxury this time around of being able to spend a little more time on all the bells and whistles, really making sure everything was the way we wanted it exactly. Not to say – I mean we’re extremely proud of Night Visions, it’s just we’re a young band and we didn’t have very much money. Renting studio time is extremely expensive and we only had so many days, so the attitude was kind of like, “We need to get absolute efficiency out of each day in the studio.” We would end up working 18-20 hour days sometimes and kind of losing our minds by the end of the process, whereas this time around we had the opportunity to really try to set some healthy work schedules. We really tried to treat it like a nine-to-five job as much as possible, which also helps because if you’re working on the same piece of music for longer than five or six hours, I mean… I lose perspective on what anything sounds like after that. I have to stop using my ears for a little bit, so being able to break like that, I think, helped us a lot. Did you ever find that it was actually stifling to have that much time to be working on something, rather than the get-in-get-out rush? No, I didn’t find that we were lethargic or having so much time that we were waffling on decisions or something. We’re pretty impulsive creators as a group, and once something sounds right and we’re all like, “Oh yeah that’s it,” we’re ready to move on. That said, we do want to be able to take the time to try out 30 different snare drums sounds, so we’re using the exact one that we want, and then after we find that snare drum, we’re going to want to try blasting that sound through the speakers of our studio, re-amping it, recapturing the sound so it sounds even bigger with the room sound. So we always took the attitude that there’s no bad suggestion – if you think something in your head’s gonna sound good, suggest it and let’s try it! It’s a really cool work environment. Pretty fun. You just started talking about experimentation. I noticed that you’ve got significant sampling on Smoke + Mirrors. We’ve always been all about combining – I like electronic with organic, and we lie somewhere between those two. I like to think of it like Darth Vader – half man/half machine – because the drums sounds and the technology have just come so far. A drum by itself and a sample by itself don’t really sound as good as a drum and a sample together. When I was at Berklee, I was doing film scoring, and there was a clinic – I cannot remember his name – but an amazing musician and he scored The Color Purple. And he was talking about how before you go into a session to record an orchestra, you have to create what that orchestra’s going to sound like with a computer – with MIDI – in order to sync it up with the scene and make sure everyone all agrees that’s what it should sound like before they spend the money to record an orchestra. So he was saying you go into the session with this MIDI orchestra and then you record the real orchestra, and the real orchestra didn’t sound as good by itself as when it was mixed with the MIDI orchestra, because all the samples we have today are of such high quality that they sound so good! Mixing it in there just adds the richness that you don’t get otherwise. So that, along with a classic hook where they were talking about the Terminator movies. At one point there’s a car, like the bad guy’s coming at you, and there’s a sound you hear. It’s the sound of an explosion, mixed with a lion roaring, mixed with a gun going off, and all these things combine so you don’ realize you’re hearing them, but they all combine to form this greater sound. All these concepts influenced me as a musician going into the studio in the producing aspect of creating music, and we as a band definitely have that mentality. We definitely don’t think you need to keep adding and adding and adding in order to make a big sound. If something sounds good on acoustic guitar by itself and you don’t need anything else, then it’s done! But having the option is always a good thing, in our minds. 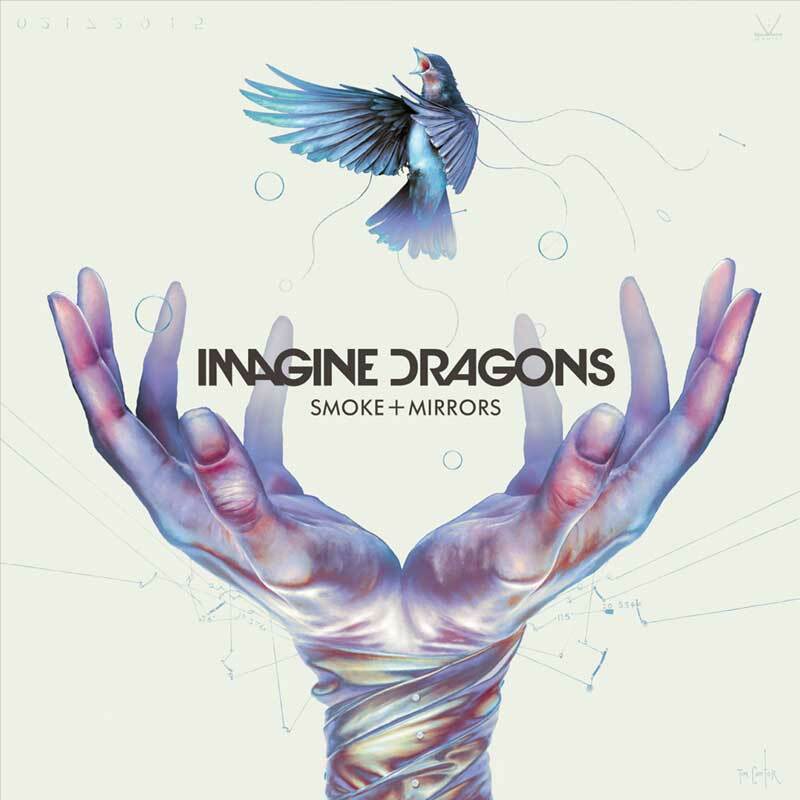 How did you decide upon the title Smoke + Mirrors? Dan started the demo that later became the song “Smoke and Mirrors”. When we all got into the studio and were trying to work out the very beginnings of what the album was in our mind, “Smoke and Mirrors” stuck out to all of us as a really important song, and it felt like that song defined what we were trying to state with this album – like it had a more mature sound to it, but it was still very much us. There’s something about it we all just felt was very special – so we decided to call the album Smoke + Mirrors for that song, but also because ‘smoke and mirrors’ is pretty Vegas-y, and we’re a Las Vegas band. Without giving too much else away, those are the main reasons. I always hate spoiling what things mean. As a music lover, I enjoy lyrics or things like album titles, and then I’ll read in an interview what that actually meant to the artist, and they’ll say something like, “Oh that was actually about my breakfast,” – something like that – and it meant something totally different to me. The album's dark, weary traveler-like imagery suggests your experiences on the road greatly affected the music. Our touring absolutely had a huge impact on the album. We were writing it while we were on the road, so there’s a whole batch of demos made while we were in Scandinavia that all have a particular sound to them, and things like that. We were also learning new computer programs to make music. We’re always trying to challenge ourselves and keep pushing the limit, and as we were learning things in those programs, the demos sounded a certain way. So that, combined with how emotionally you feel when you’re on the road for a while… You know, there were happy song patches, there were sad song patches, exhausted patches, exhilarated patches. I think the whole spectrum – the whole gambit of human emotion – is in the mix. If you look at 'Smoke and Mirrors' alone, that one is very dark. We’re talking about a song with the lyric, 'I’m starting to cave / I’m losing my flame / I wanted your truth / but I wanted the pain to disappear' and 'All I believe / is it a dream / that comes crashing down on me / All that I hope / is it just smoke and mirrors'. It felt like self-doubt - like this knowledge of where the band has gone and is going, and wondering if you're deserving of it all. There’s definitely a theme and motif of questioning everything, and not taking anything we thought was a reality for granted as a reality anymore, you know – what even is anything? Being on tour is kind of like being in the eye of the hurricane: Our lives stay pretty consistent, even though it’s pretty strange traveling from place to place and playing show after show. You get a strange sense of consistency in that routine, which we love as a band. I think we’re the kind of personalities that really like that. But in terms of realizing how our lives have changed, you have the worst perspective on it. And then you get off the road, and that’s when you fina;ly actually see how everything has changed – so you’ll see essentially that in there, too. Were there any specific places you had always wanted to travel, that you have since had the opportunity to visit? Absolutely! We got to go to Beirut – I had always wanted to go to Lebanon, and that was amazing. We got to go to Hong Kong for the Transformers premiere. The Hong Kong skyline is unbelievable – it’s actually the closest thing to Las Vegas I think I’ve found anywhere else because it lights up so unbelievably… But on top of that, for a performance, Paramount had gotten the city to agree to coordinate a fireworks launch from the tops of the skyline. That’s something I shouldn’t have ever been able to see, but that was amazing! Scandinavia, too – I had gone to Denmark with my father once, but I never got to see Norway and Finland – those are really cool places, as is Sweden. It suits Imagine Dragons’ lifestyle, doesn’t it? Exactly! I think there’s something about each of us that makes it so that we love the life of touring. 302 million people have listened to 'Radioactive' on Spotify. To provide perspective, that’s approximately 14 million less streams than the population of the United States. 'Radioactive' was the most streamed song of 2013 on Spotify, and in 2014 Imagine Dragons was the No. 2 most streamed group globally on Spotify. The Spotify numbers have been unbelievable. To know that many people are listening to us is, uh… It’s such a big number that I don’t even know what that means. I don’t even have a concept of what it is, but I’m so grateful. If that many people are streaming it, then we feel confident that we can travel and people will come to the shows. That’s pretty much all we want. In terms of your lifestyle before and after Night Visions, what (if anything) has changed? Do you find that you’re able to fill the quiet moments at home? Yes! Hanging out with an old friend is just about the most exciting thing I get to do. You realize the things you took for granted – you know, some of the most special, magical things in life that you never realized were so special, like hanging out with an old friend, staying up late, having conversations… eating food that you love, your parents’ cooking… playing video games, you know. Well, we are pretty obsessed with League of Legends at the moment. The League of Legends Season 4 World Championship was in Korea, and we worked their championship song, “Warriors“. We got to perform in Seoul in the Fifa World Cup Stadium, which was an amazing experience… but besides that, I love old-school RPGs, Final Fantasy 7, even Mario Galaxy and stuff like that. We’re gamers. What is your hobby when you’re not touring? Do you ever put down the music? No, [laughs] we’re pretty bad at putting down the music. Honestly, I just put down the music for other music. I write jazz puns, which is where you take the melody of one jazz song and put it over the harmony of another jazz song, and then it’s like a bastardized version of both. It’s almost like a Sudoku puzzle. I just do it because I love the music, but it’s also a total puzzle for me, and there’s something about that which I really like. So in our off-time, I’m doing other music-y things and trying to get better at music programs, busting out the viola again – trying to keep my chops up! It’s hard enough to stay – you know, the music’s really hard! I’m honestly just practicing drums most of the time. My worst fear is that we go out, and I’m somehow not able to perform the music we recorded as well as I want to live. Like I said, we feel like we have this opportunity in front of us. We just really want to make the absolute most of it. Do you have time to listen to other artists’ music as well? Yeah, we always try to stay fresh on what’s happening. We’re not necessarily the best at it all the time – especially when we’re on the road – but when we’re at home, Ben has Alt Nation in his car and we’ll listen to everything. Yeah! There’s this guy, BRONCHO, who we’re all really into. He’s got that song “Class Historian,” and we all totally like that song. Honestly, the best way I get to discover music is by playing with someone. So for example, when we were touring in England, we had the great privilege of playing with Jake Bugg, who is just unbelievable. He’s not very popular in the States yet – he’s not a household name – but he really should be, because he’s just an unbelievable performer. He’s really big over there, and getting to hang out with him and see him perform a few times has made me into an even bigger fan! He is the real deal, and if anyone hasn’t heard Jake Bugg’s music, I highly recommend you check it out. What’s the goal for 2015?? [long pause] We have some pretty ambitious plans for the tour, and we feel very confident about it, so if anything, I’d say our goal for 2015 is just to maintain. So if we could just stick to that plan, I feel like everything is going to work out just fine. Are there any other artists whom you would love to perform with this upcoming year? Sure, yes. If Neil Young ever wanted to perform with us, we would be so ecstatic! There’s plenty of musical heroes out there – if Paul Simon wanted to do something, Willie Nelson… Between the four of us, we have a pretty large list of musical heroes. One of the cool things about the band doing so well is that we’re getting opportunities to make music for or in front of these people. Like that Beatles thing we got to do was really cool – getting the chance to perform a Beatles song for the Beatles, which is also the most intimidating situation you could ever be put into. You’re not going to outdo how good they did! They did it perfect, so your best hope is just not to embarrass yourself too badly. But at the same time, it was so much fun! Where is there room for Imagine Dragons to grow and what is the next step for the band, in terms of that growth? I feel like, on the one hand you can’t help but sound like yourself. At the end of the day, we’re going to grow and change, but we’re always going to sound like us. I feel like this album, even though it sounds in some ways different than Night Visions, totally sounds like us. I feel like it’s an authentic representation of what we, as the band Imagine Dragons, are. Hopefully, everyone else feels that way too. Four guys living together in a house with a recording studio and video games? Sounds like you’re living the life. Yes. Honestly, all of us got into this because we loved playing music, we loved performing and playing shows, and there’s no feeling in the world you get that comes anything close to the feeling you get when you get up on stage and play. If that feeling didn’t completely fulfill us, there’s no way we’d be able to continue doing it for sure. But I don’t take it for granted – I consider us so lucky to be in the position we’re in – to be able to travel the world playing our music. I never dreamed growing up that I would be able to do that. 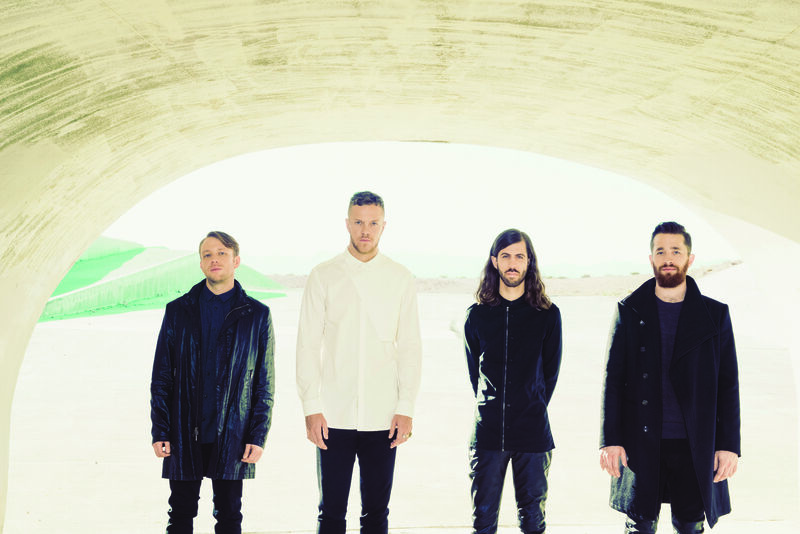 Atwood Magazine wishes Imagine Dragons the very best for 2015. 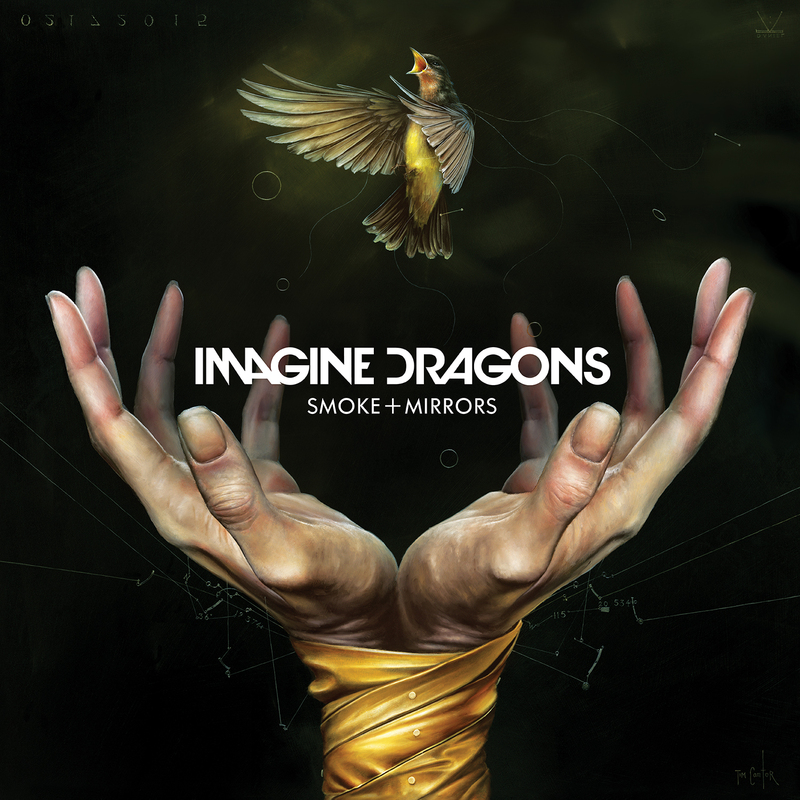 Smoke and Mirrors is available now via KIDinaKORNER / Interscope Records!